It's easy to think of winter as a boring time in the garden. If you can still take walks, winter is a good time to collect a variety of seeds to dry for later use. I keep a couple of baskets, and now a little glass bowl, where I can easily toss in pine cones and other large seed pods. I started by focusing on finding large, and unusual, pine cones, then graduated to other seed pods, such as gum balls. 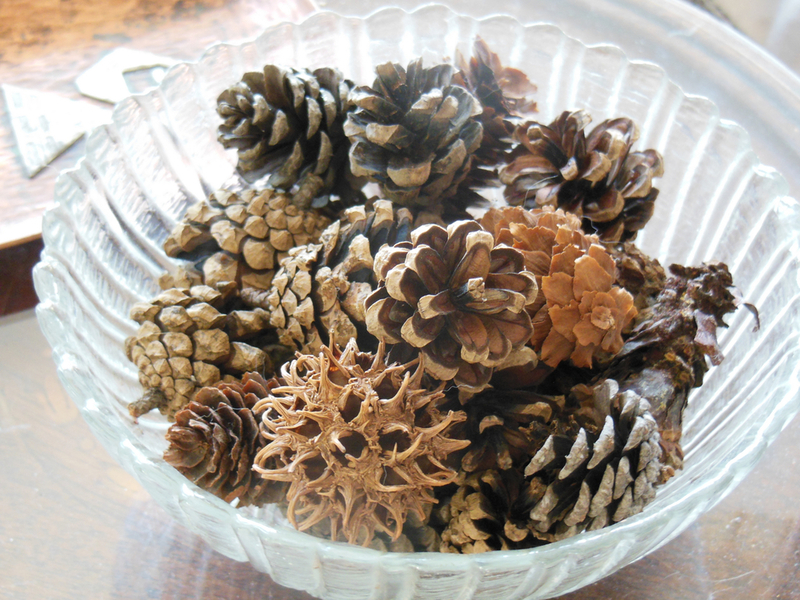 Last fall, I found a little stash of tiny pine cones and started to collect them. One evening, as I was setting the table for beekeeping friends, I unveiled our new beekeeping club business cards as place cards. And guess what came in quite handy as little place card holders! These could be spray painted for a more formal look but I think they are perfect size for a nature-themed table for weddings, anniversaries, birthdays - or beekeeping club dinner meetings!